Dynamite Dare is a fun game. The aim of the game is to stop the time bomb detonating in order to win - Diffuse or lose! Players take it in turns to flip down one of the many fuses, with the hope of finding the one fuse that will stop the bomb. Be careful as you may be unlucky and flip the fuse that causes the dynamite to be launched - and making everyone jump at the same time. Fail to flip all the fuses in time and the bomb will go off. It's a fast paced challenge, and slightly addictive. They are short quick games, and once you start playing it you go again and again. And, you quickly get absorbed in the thrill of the game, and it's more about experiencing it rather than who the winner is. Which is great, so much more fun. 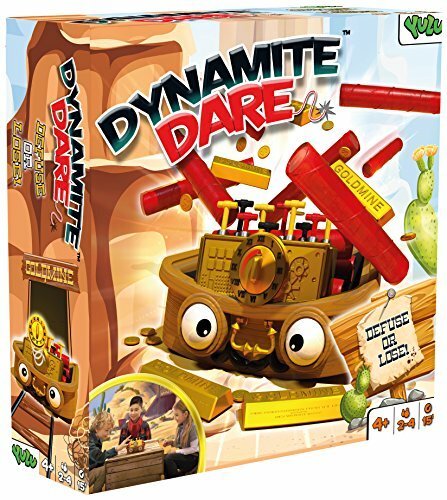 The kids have had loads of fun playing Dynamite Dare, it involves a lot of laughter and screams of delight - they especially love that it makes them jump, which they all find hilarious. It's fast moving and hectic and a lot of fun. This is a game the kids pull out and play time and time again. It's one of their new favourites. The Dynamite Dare game from Brainstorm is suitable from 4+, RRP £19.99.